What is “Tattoo Makeup” Anyways? There are a few different types of “tattoo makeup” that people often confuse into one generalized category. This page is to set the record straight and explain the difference between otherwise completely different types of “tattoo” products. 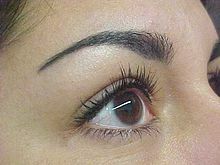 Permanent Tattoo Makeup, or permanent makeup, is a cosmetic technique that uses tattoos to resemble makeup. The procedure dates back to the start of the 20th century, though it was often concealed in it’s early days. Other names used to describe this type of tattoo makeup include dermapigmentation, micropigmentation, and cosmetic tattooing. There are many different reasons people choose to have makeup or body hair tattooed in place permanently, the most common reason being to combat medical conditions. For example, those who might have been in a tragic medical accident and are unable to grow certain facial hair, such as eyebrows, may opt to have a permanent makeup procedure. Other popular tattoo makeup procedures include lip enhancements and pigments, areola pigmentation and camouflaging scars. Unfortunately there are also many cases where the permanent tattoo does not turn out the way the patient would have liked it to. 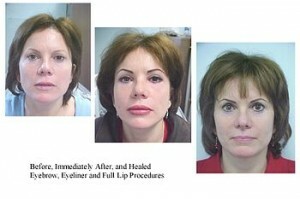 Popular complaints are that the permanent makeup is the “wrong color”, “too big”, “uneven” or “too dark”. As with any tattoo, permanent makeup procedures gone wrong are still just that, permanent, and subject to the same types of tattoo cover up methods as any other tattoo. However, permanent makeup usually tends to be harder tattoo removal procedures due to the types of inks and pigment colors used in modern permanent tattoo makeup procedures. Tattoo cover up makeup or tattoo concealer makeup is makeup created specifically to temporarily hide tattoos. 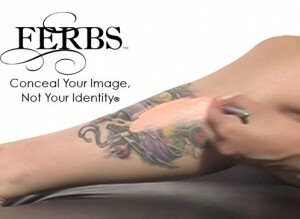 We recommend (of course) Ferbs Cosmetics temporary tattoo cover up makeup which has been formulated specifically to cover up vibrant tattoo inks. It is not necessarily a “tattoo makeup” perse, at least not in a traditional sense, but it is a type of specific makeup used to cover up tattoos. With tattoo cover up makeup users can effectively and temporarily hide their tattoo for a short amount of time without wearing clothes. There are many different reasons people choose to or feel pressured to cover up tattoos including those applying for a new job, weddings and formal event attendees, military and municipal workers and more. Tattoo cover up makeup usually requires two (2) different makeup products and two (2) different makeup brushes, four (4) products total. The first part is the bulk of the application process and uses a foundation brush to spread the temporary tattoo cover up concealer over the entire tattoo, allowing each layer to dry in between applications until the tattoo is completely concealed. Finally, a powder brush is used to apply a setting powder to the dried tattoo concealer, blending the cover up to match your skin tone completely and locking the product in place. The setting powder is an equally essential part to both match your skin tone and keep the temporary tattoo makeup from rubbing off on clothing or more and should not be skipped. Most products including Ferbs Cosmetics temporary tattoo cover up can be removed easily with baby oil. Currently there are several different tattoo cover up makeup products on the market at different price points and several factors to consider when choosing the best tattoo cover up. For more help, make sure to check out this article which discusses ten things to consider when choosing a tattoo concealer. A third type of quote/unquote “tattoo makeup” is makeup that is applied on the body to resemble a real tattoo. This is most often referred to as a “henna tattoo” but can also be referred to as a “temporary makeup tattoo” or a “temporary tattoo with/from makeup” or even simply a “temporary tattoo”. In recent years the rise in amount of Henna Tattoo Artists has helped to increase the popularity of this type of tattoo makeup in the United States. Even both henna and makeup tattoos designed from makeup take a much less time and fewer sessions to apply, a tattoo designed from makeup is still just as hard to implement as any regular tattoo, and some will argue that it is actually harder since most artists who have the design skills do not always have the tattoo makeup skills required. Occasionally this type of tattoo makeup will also include jewels or rhinestones embedded on the skin as part of the tattoo makeup design. Nonetheless, you still must be sure to get a henna tattoo from a licensed professional in a sanitary environment, just like you would any other tattoo. There have been many reported cases of infections and other complications from unsafe henna and tattoo makeup. Most often the cause was that the applications were not performed in a safe environment or did not use a safe and FDA approved 100% Henna ink. 100% pure henna colors skin in a sort of color between orange, red, burgundy, brown or coffee. “Black henna” is never 100% pure henna and often not safe. If you are considering using henna tattoo makeup we caution you to read about the dangers of PPD Black Henna before using this type of tattoo makeup. Ok bad jokes aside, I’m sure there are more types of so-called tattoo makeup that we missed. Are there any other types of “tattoo makeup” you often hear about in the real world and feel we should include in this discussion?